Objective To systematically review the literature to identify risk factors for calf strain injury, and to direct future research into calf muscle injuries. Data sources Database searches conducted for Medline, CINAHL, EMBASE, AMED, AUSPORT, SportDiscus, PEDro and Cochrane Library. Manual reference checks, ahead of press searches, citation tracking. From inception to June 2016. Eligibility criteria for selecting studies Studies evaluating and presenting data related to intrinsic or extrinsic risk factors for sustaining future calf injury. Results Ten studies were obtained for review. Subjects across football, Australian football, rugby union, basketball and triathlon were reported on, representing 5397 athletes and 518 calf/ lower leg muscle injuries. Best evidence synthesis highlights chronological age and previous history of calf strain are the strongest risk factors for future calf muscle injury. Previous lower limb injuries (hamstring, quadriceps, adductor, knee) show some limited evidence for an association. Numerous factors lack evidence of an association, including height, weight, gender and side dominance. Summary/conclusion Increasing age and previous calf strain injury are the most predictive of future calf injury. The overall paucity of evidence and the trend for studies of a high risk of bias show that further research needs to be undertaken. In the literature to date, there is an absence of definitive data relating to risk factors for CMSI. Some suggested factors based on existing studies and anecdotal opinions relate to player intrinsic characteristics such as age,6 fatigue or training volumes7 14 and previous soft tissue injuries.6 8 The identification of risk factors for injury may assist in the assessment and management of athletes and injury prevention. This systematic review aims to synthesise variables influencing risk of future calf strain injuries in sport, with a secondary aim to direct future research into this important area. A systematic literature search was conducted across databases Medline, CINAHL, EMBASE, AMED, AUSPORT, SportDiscus, PEDro and the Cochrane Library, from inception to June 2016. Keywords from the research question were mapped to medical subject headings where possible. Citation tracking and reference list scanning of included articles and manual ahead-of-press searches were carried out subsequently. References acquired were imported into EndNote X3 software (Thomson Reuters, USA) and duplicates were removed. Two examiners (BG and TP) independently applied selection criteria to abstract and titles of the search yield, subsequently reaching agreement on full-text versions to be obtained for potential inclusion. Selection criteria were reapplied against full-text versions by both examiners in consultation. See Supplementary Material for an example search strategy. Articles were included if examining either a primary or recurrence of a CMSI in humans in sport or sports-related activity. These injuries were distinguished from Achilles tendon-type pathologies, traumatic bony or contusion-type soft tissue injuries, or overuse conditions where possible. Included studies had to present discrete data for calf or lower leg muscle injury. Included studies were required to examine one or more variables in association with risk of CMSI. Only risk factors measured prospectively were acceptable, unless retrospective analysis evaluated non-modifiable risk factors. This was to avoid the limitations of retrospective analysis for identifying whether measured relationships were the result of, or predisposed to, the recorded injury. Data relating only to match-play versus training injury incidences were also considered irrelevant to the aims of the review. Epidemiological or descriptive studies reporting incidences only, intervention studies, non-systematic reviews, case studies and opinion articles were not included. Studies were required to be available in full text, from peer-reviewed sources and written in the English language. Unpublished data and conference abstracts were not included because of the lack of rigorous methodological appraisal. Data extraction was undertaken with a focus on sports activity, participant characteristics, specific extrinsic or intrinsic risk factors examined and CMSI injury outcomes. Methods of analysis were also examined in terms of injury diagnosis, study durations, overall results (including statistical techniques used and their specific findings) and general heterogeneity between variables measured in different studies. Non-blinded reviewers (BG and TP) extracted data independently, including means, SD, HR, RR and OR. Other variables extracted from included studies related to match or activity characteristics. Because of the small number of studies available, and heterogeneity of data sets and variables measured, meta-analyses were not performed. Instead, a qualitative synthesis of results was primarily undertaken, with any probability and risk data (HR, OR and RR) presented in the results of this review taken directly from included studies. Paucity of data did not permit meta-analysis or further computation of other statistical relationships. A risk of bias assessment was carried out by two independent reviewers (BG and TP) using a modified version of the Quality in Prognosis Studies (QUIPS) tool, as previously outlined15 16 and also conducted in a recent muscle-related systematic review of the literature.17 Six subheadings were used to appraise different study design elements and potential sources of bias, with a number of criteria within each category, each scoring a ‘yes’ or ‘no.’ A subheading was considered to have high risk of bias if less than 75% of the items within it achieved a score of ‘yes.’ The subheading was otherwise considered to have a low risk of bias if more than 75% of the criteria received a score of ‘yes.’ The overall risk of bias for a study was then calculated according to how many of the six subheadings were deemed to be high risk, which has been advocated for in the literature previously.18 A study was considered to be of low overall risk of bias if at least five of the six categories were satisfied, along with requiring a low risk for the subheading relating to outcome measurement (item 4). All discrepancies in results of risk of bias assessment between independent reviewers (BG and TP) were compared and discussed until full agreement was reached. A copy of the modified QUIPS can be found in online supplementary appendix 1. Strong evidence: consistent findings in more than one high-quality study. Moderate evidence: consistent findings in one high-quality study and one or multiple low-quality studies, or by consistent findings in multiple low-quality studies. Limited evidence: findings presented from a single study only (high-quality or low-quality study). Conflicting evidence: findings across more than one study that does not have consistent results. No evidence: no randomised controlled trials or non-randomised controlled trials available for assessment. The initial search yielded a total of 1188 studies after removal of duplicates. 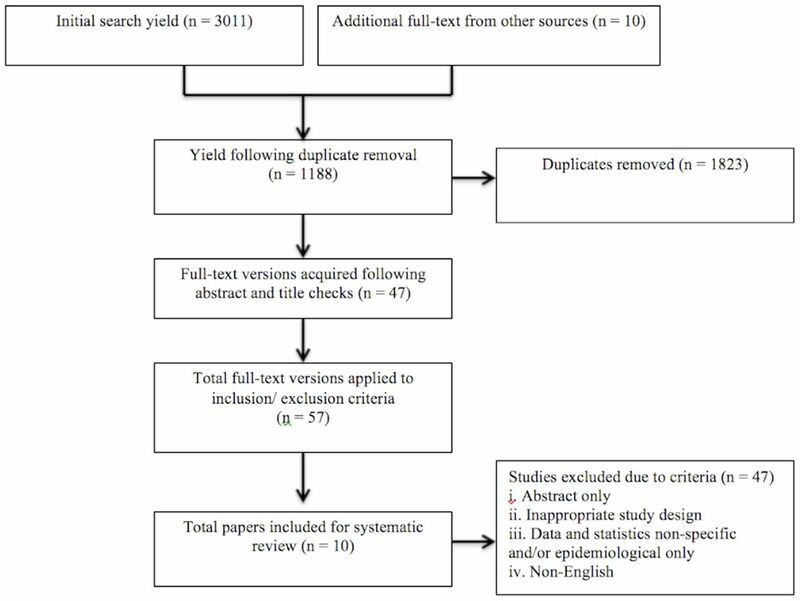 Application of selection criteria to titles and abstracts of the initial yield resulted in full-text versions of 47 studies being acquired for further analysis. Application of criteria to full-text articles left eight studies remaining to be included. Citation tracking, ahead-of-press searches and reference scanning resulted in another potential 10 articles, of which two met the inclusion and exclusion criteria (figure 1). Reasons for exclusion are included in online supplementary appendix 2. A total of 10 studies were included for the purposes of this systematic review, accounting for a total participant pool of more than 5000 participants across football,7 8 14 22 23 Australian Rules football,6 rugby union,10 24 basketball25 and triathlon.13 Data extraction was performed on all of the 10 included studies. A detailed description of the study characteristics is presented in table 1. Seven studies7 10 13 14 22 24 25 were scored with a high risk of bias, while the other remaining three studies6 8 23 were determined to have a low risk of bias (table 2). Authors retained agreement on all scoring and bias assessment results. Key areas of bias across the 10 included studies were related to study attrition, study confounding variables and measurement of prognostic factors. All studies presented simple univariate statistical methods, while four offered some relevant information from multivariate models.6 8 23 25 For full details of the best evidence synthesis, see table 3 below. Moderate evidence was found for no association between limb dominance and calf muscle or lower leg muscle injury, across one high risk and one low risk of bias study.8 22 Limited evidence for no association between player stature and future CMSI was highlighted in a single study with low risk of bias, while strong evidence of no relationship was presented across a pair of low risk of bias studies reporting on player mass.6 8 There may however be a limited association in terms of the specific measure of body mass index (BMI) and calf strain risk.6 Player height and gender showed limited evidence for no association in low-risk and high-risk studies, respectively6 25 (table 3). The precompetition or preseason period showed limited evidence for higher risk of calf injury compared with other phases of the season, examined in a single high risk of bias study.24 During the competitive season, a pair of high risk of bias studies together provides moderate evidence for no association between periods of greater playing schedule congestion or less between-match recovery and sustaining a CMSI.7 14 Examining playing standard or competition level offered only limited findings of no association in a single high-risk study.25 The actual position played by the athletes in rugby and football codes provides conflicting evidence of no relationship8 10 (table 3). Four studies presented data relating to other previous injury and future calf or lower leg injury in triathletes, football and Australian Rules athletes6 8 13 23 (table 3). This review established that the strongest risk factors for CMSI are increased player age and any history of previous CMSI. There may also be limited evidence that other lower limb soft tissue or joint injuries (hamstring, quadriceps, adductor, knee) predispose athletes to calf or lower leg muscle injuries, along with being in the preseason period or the player having an increased BMI. This review also identified a number of factors showing no association with future calf strain. Strong evidence for no association was found for absolute player mass, along with moderate evidence for no relationship with reduced between-match recovery or schedule congestion. A number of individual player characteristics (height, stature, side dominance, gender) and playing standard further failed to highlight an association, as did any environmental factor examined. There seems to be some conflicting evidence regarding positional demands in football and rugby codes, across multiple studies of both low and high risks of bias. Overall, the small number of studies and variables available for synthesis together with the lack of homogeneity in data presented and methodological approaches to outcome measurement limits the conclusions that can be drawn. In addition, the quality of the included studies was variable. Risk of bias assessment showed that there were clear discrepancies in terms of overall study quality, which influenced the strength and number of definitive findings when synthesising the evidence. Local structural tissue alterations are an important maladaptation to consider, particularly given their association with tendon continuum presentations in the Achilles.36 37 Literature has previously established the importance of gastrocnemius fascicle length in sprinting athletes, and therefore maximal power outputs over fast velocities,1 with both a strong and statistically significant correlation with maximal sprinting speed.1 2 This may also highlight the importance of tissue extensibility or flexibility, of which long fascicular lengths are a purported requisite, despite no direct evidence exploring its role in calf strain injury risk. More recent studies into the hamstring strain injuries have underlined this structural necessity in the hamstring complex.38 The presence of shorter fascicle lengths in the biceps femoris below a certain threshold resulted in significantly elevated risk for future hamstring muscle strains.38 Local factors relating to calf muscle fascicle length, pennation angle, cross-sectional area and tissue quality may therefore be worthwhile when evaluating risk of injury compared with more global and less specific variables such as stature, height and weight. These areas provide some direction for future calf research, along with recent studies that have presented significant associations between measures of different strength qualities and soft tissue injury—namely eccentric strength39 and strength endurance40 for sustaining future hamstring muscle strains. Related works have also identified an important association between greater levels of eccentric strength and increasing fascicle lengths as able to ameliorate risk of non-modifiable risk factors of age and previous injury history,38 which is particularly relevant given that these were the only two risk factors with strong evidence in this review. Rehabilitation and conditioning practices could hope to mirror these findings, along with recent literature detailing the importance of long-term training chronicity in building athlete preparedness and injury resilience.41 Implementing interventions for eliciting adaptation to fascicle lengths and eccentric capacity in the calf complex however require scientific validation and further research. The small number of studies and variables explored in this review provides some direction in the topic of CMSI. However, the overall paucity of homogenous data and overall study quality influence the quality of conclusions that can be made. There is also the potential for a publication bias given that only published literature was included for the purposes of review, and a language bias associated with inclusion of English-language only publications. Findings from this systematic review should be considered with understanding that there are limitations in both the quality of evidence and the amount of evidence available. Clinical interpretation of findings should consider that there are potentially other influences on risk for future CMSI than are mentioned or examined in detail in this systematic review. History of a previous calf muscle strain and increasing player age provide the strongest evidence for future calf strain risk. Factors such as player weight, height, gender and side dominance can be considered to lack evidence of an association with sustaining a calf muscle injury. A number of other measures and variables may also have an influence on risk; however, additional research is required to build the evidence base in this area, and to offer some further understanding of risk. The calf complex is essential to lower limb mechanics during locomotive and weight-bearing tasks. Calf muscle strain injuries (CMSI) are a common soft tissue injury across numerous team and individual sporting codes. Literature in this area is limited, and a systematic analysis establishing a group of possible risk factors, and any inter-relationships between these factors, has not been performed to date. Despite a limited number of studies available, data analysis provides evidence for age and previous CMSI as the strongest risk factors for calf strain injury. Previous adductor, hamstring, quadriceps or knee injury may also influence likelihood of injury. Variables relating to individual player characteristics and environmental descriptors do not seem to be related to future calf or lower leg strain. This review highlights the factors that need further study in the scientific literature, with future direction of research similar to that undertaken recently in the field of hamstrings.
. Fascicle length of leg muscles is greater in sprinters than distance runners. Med Sci Sports Exerc 2000;32:1125–9.
. Determinants of injuries in young dancers. Med Probl Perform Art 2002;17:105–12.
. Incidence and prevalence of musculoskeletal conditions in collegiate tennis athletes. JMST 2015;20:137–44.
. AFL injury report. Australian Football League (AFL) 2014;2014:1–20.
. Injury risk in professional football players with special reference to the playing position and training periodization. J Sports Med Phys Fitness 2012;52:631–8.
. An epidemiological investigation of training and injury patterns in British triathletes. Br J Sports Med 1994;1994:191–6.
. The impact of short periods of match congestion on injury risk and patterns in an elite football club. Br J Sports Med; Published Online First 18 December 2015.
. Evaluation of the quality of prognosis studies in systematic reviews. Ann Intern Med 2006;144:427–37.
. Assessing bias in studies of prognostic factors. Ann Intern Med 2013;2013:280–6.
. Best evidence synthesis: an intelligent alternative to meta-analysis. J Clin Epidemiol 1995;48:9–18.
. Updated method guidelines for systematic reviews in the cochrane collaboration back review group. J Spine 2003;28:1290–9.
. Relationships between training load, injury, and fitness in sub-elite collision sport athletes. . J Sport Sci 2007;25:1507–19.
. Differential age-related changes in motor unit properties between elbow flexors and extensors. . Acta Physiol 2010;200:45–55.
. Architectural adaptations of muscle to training and injury: a narrative review outlining the contributions by fascicle length, pennation angle and muscle thickness. Br J Sports Med (Published Online First: 27 January 2016).
. Short biceps femoris fascicles and eccentric knee flexor weakness increase the risk of hamstring injury in elite football (soccer): a prospective cohort study. Br J Sports Med (Published Online First: December 2015). Contributors BG and TP made equal contributions to the work. Both authors gave permission for the final version to be submitted.